1001 Medical Park Drive, S.E. Cancel those plane tickets and put your wallet away. Now you can gamble Vegas-style without risking a nickel. Baudville's Video Vegas is about as good a simulation of those infamous Las Vegas gambling machines as you're ever going to see. Available for your risk-taking pleasures are the Lucky 7 slot machine, draw poker, Keno and Blackjack, all of which operate in the same manner as the Vegas originals. For those of you who have never had a chance to see those Las Vegas machines, here's a quick rundown of how the games work. Everyone, whether they have actually played or not, is familiar with slot machines or "One-Armed Bandits" as they're sometimes called. 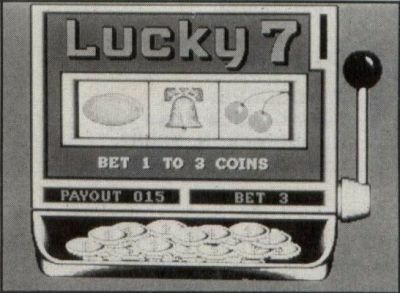 The Video Vegas version, called "Lucky 7," is a realistic simulation of the 3-reel type of machine that squeezes so many dollars from unsuspecting tourists each year. The graphics are superb, but just as important—especially in the case of a slot machine—the sounds have been carefully programmed. This is some of the best use of sound I've heard on the ST. All the way from the sound of the crank being pulled to the clinking of coins falling into the machine's tray when you hit a payoff, the simulation is about as close to the real thing as you could expect from a computer game. In the video version of draw poker, you place your bet and then are dealt five cards. After choosing which cards you wish to keep, you draw new ones to replace those discarded. If your hand contains a pair (jacks or better), two pair, three of a kind, a straight, a flush, a full house, four of a kind, a straight flush or a royal flush, a payout is in order, based on your hand and the amount originally bet. In Keno, a Bingo type game, you mark from 1 to 15 of the 80 numbers on the board, after which the computer randomly selects 20 numbers. Payoffs are based on the number of "hits," numbers that both you and the computer marked. Finally, in Blackjack, you draw cards in an effort to get as close to 21 as possible, without busting (going over). If you do a better job than the dealer, you're awarded a payoff based on the amount of your bet. There are a lot of details to the game that I won't go into here. Most of you are familiar with this game, anyway. Rest assured that Video Vegas's version of Blackjack is a complete simulation, including such player options as doubling, splitting your hand and insurance. For those who need a refresher course, the manual provides all the details. The graphics in all four simulations are outstanding. Recommendation: If you like Vegas-style action, buy it.